It is replaced by the Zebra QLn320. The updated QL320 Plus direct thermal mobile printer has been designed with the most advanced technology in rubberized over-molding to maintain both rugged construction and minimal weight. With center-loading media, smart battery monitoring and an optional LCD, it provides user-friendly options to keep your business moving. All units ship with one user's manual. Direct thermal Mobile Printer (USB, 8MB/16MB, LCD, Cable Ready, Linered Platen and Belt Clip). Power supply (Part# CC16614-G4) not included. See accessories. Direct thermal Mobile Printer (3 inch Print width, USB, 16MB RAM, 8MB Flash, LCD, ZVR 802.11b/g, Linered Platen, Label Present Sensor and Beltclip). Power supply (Part# CC16614-G4) not included. See accessories. Direct thermal Mobile Printer (USB, 8MB/16MB, LCD, ZVR 802.11b/g, Linered Platen and Belt Clip). Power supply (Part# CC16614-G4) not included. See accessories. Plus Direct thermal Mobile Printer (3 inch Print width, USB, 16MB RAM, 8MB Flash, LCD, 802.11b/g, Linered Platen and Belt Clip). Power supply (Part# CC16614-G4) not included. See accessories. Plus Direct thermal Mobile Printer (3 inch Print width, 8MB/16MB, LCD, Bluetooth, Linered Platen and BeltClip). Power supply (Part# CC16614-G4) not included. See accessories. Direct thermal Mobile Printer (USB, 8MB/16MB, LCD, ZVR 802.11b/g, Linerless Platen and Belt Clip). Power supply (Part# CC16614-G4) not included. See accessories. Direct thermal Mobile Printer (USB, 8MB/16MB, LCD, ZVR 802.11b/g, Linered Platen, Belt Clip and mW FD). Power supply (Part# CC16614-G4) not included. See accessories. 8MB/16MB, LCD, US/Canada English, 802.11b/g, Direct thermal linered platen, belt clip. This is the TAA compliant version of printer (Part# Q3D-LUKA0000-00) for government purchasers. Please call for more information. Power supply (Part# CC16614-G4) not included. See accessories. Direct thermal Mobile Printer (USB, 8MB/16MB, LCD, ZVR 802.11g, Linered Platen, Belt Clip and HT). Power supply (Part# CC16614-G4) not included. See accessories. 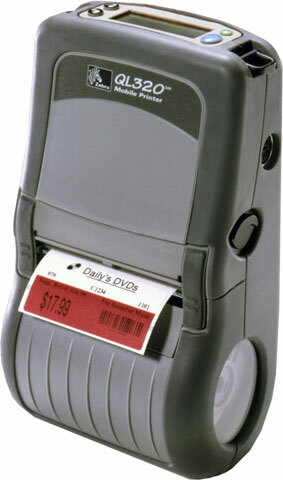 By far one of the most popular mobile thermal printers, the QL320 can make labels or receipts up to 3” wide wherever you may be. You often find this printer being used to create receipts for deliveries, generate location labels in a warehouse, and even issue tickets. With a rugged design, the QL320 is made to be in the field working along mobile computers and tablets. Communicating with the printer is easy with options for Bluetooth, Wi-Fi, or a direct cabled connection. If a larger label size is needed you would want the QL420 Plus, but for most on-demand print applications the QL320 will offer high quality print and easy integration. Lighter Plug, RCLI-DC Charger, 12V. For RW and QL Series Printers.